This essay by Julian Assange is taken from the introduction to The Wikileaks Files: The World According to the US Empire, a collection analyzing how Wikileaks’ release of US diplomatic cables impacted foreign policy. One day, a monk and two novices found a heavy stone in their path. “We will throw it away,” said the novices. But before they could do so, the monk took his ax and cleaved the stone in half. After seeking his approval, the novices then threw the halves away. “Why did you cleave the stone only to have us throw it away?” they asked. The monk pointed to the distance the half stones had traveled. Growing excited, one of the novices took the monk’s ax and rushed to where one half of the stone had landed. Cleaving it, he threw the quarter, whereupon the other novice grabbed the ax from him and rushed after it. He too cleaved the stone fragment and threw it afield. The novices continued on in this fashion, laughing and gasping, until the halves were so small they traveled not at all and drifted into their eyes like dust. The novices blinked in bewilderment. “Every stone has its size,” said the monk. At the time of writing, WikiLeaks has published 2,325,961 diplomatic cables and other US State Department records, comprising some two billion words. This stupendous and seemingly insurmountable body of internal state literature, which if printed would amount to some 30,000 volumes, represents something new. Like the State Department, it cannot be grasped without breaking it open and considering its parts. But to randomly pick up isolated diplomatic records that intersect with known entities and disputes, as some daily newspapers have done, is to miss “the empire” for its cables. Each corpus has its size. To obtain the right level of abstraction, one which considers the relationships between most of the cables for a region or country rather than considering cables in isolation, a more scholarly approach is needed. This approach is so natural that it seems odd that it has not been tried before. The study of empires has long been the study of their communications. Carved into stone or inked into parchment, empires from Babylon to the Ming dynasty left records of the organizational center communicating with its peripheries. However, by the 1950s students of historical empires realized that somehow the communications medium was the empire. Its methods for organizing the inscription, transportation, indexing and storage of its communications, and for designating who was authorized to read and write them, in a real sense constituted the empire. When the methods an empire used to communicate changed, the empire also changed. Speech has a short temporal range, but stone has a long one. Some writing methods, such as engraving into stone, suited the transmission of compressed institutional rules that needed to be safely communicated into future months and years. But these methods did not allow for rapidly unfolding events, or for official nuance or discretion: they were set in stone. To address the gaps, empires with slow writing systems still had to rely heavily on humanity’s oldest and yet most ephemeral communications medium: oral conventions, speech. Other methods, such as papyrus, were light and fast to create, but fragile. Such communications materials had the advantage of being easy to construct and transport, unifying occupied regions through rapid information flow that in turn could feed a reactive central management. Such a well-connected center could integrate the streams of intelligence coming in and swiftly project its resulting decisions outwards, albeit with resulting tendencies toward short-termism and micromanagement. While a sea, desert, or mountain could be crossed or bypassed at some expense, and energy resources discovered or stolen, the ability to project an empire’s desires, structure, and knowledge across space and time forms an absolute boundary to its existence. And where is this empire? Each working day, 71,000 people across 191 countries representing twenty-seven different US government agencies wake and make their way past flags, steel fences, and armed guards into one of the 276 fortified buildings that comprise the 169 embassies and other missions of the US Department of State. They are joined in their march by representatives and operatives from twenty-seven other US government departments and agencies, including the Central Intelligence Agency, the National Security Agency, the Federal Bureau of Investigation, and the various branches of the US military. Inside each embassy is an ambassador who is usually close to domestic US political, business or intelligence power; career diplomats who specialize in the politics, economy, and public diplomacy of their host state; managers, researchers, military attachés, spies under foreign-service cover, personnel from other US government agencies (for some embassies this goes as far as overt armed military or covert special operations forces); contractors, security personnel, technicians, locally hired translators, cleaners, and other service personnel. Above them, radio and satellite antennas scrape the air, some reaching back home to receive or disgorge diplomatic and CIA cables, some to relay the communications of US military ships and planes, others emplaced by the National Security Agency in order to mass-intercept the mobile phones and other wireless traffic of the host population. The US diplomatic service dates back to the revolution, but it was in the post–World War II environment that the modern State Department came to be. Its origins coincided with the appointment of Henry Kissinger as secretary of state, in 1973. Kissinger’s appointment was unusual in several respects. Kissinger did not just head up the State Department; he was also concurrently appointed national security advisor, facilitating a tighter integration between the foreign relations and military and intelligence arms of the US government. While the State Department had long had a cable system, the appointment of Kissinger led to logistical changes in how cables were written, indexed, and stored. For the first time, the bulk of cables were transmitted electronically. This period of major innovation is still present in the way the department operates today. The US Department of State is unique among the formal bureaucracies of the United States. Other agencies aspire to administrate one function or another, but the State Department represents, and even houses, all major elements of US national power. It provides cover for the CIA, buildings for the NSA mass-interception equipment, office space and communications facilities for the FBI, the military, and other government agencies, and staff to act as sales agents and political advisors for the largest US corporations. One cannot properly understand an institution like the State Department from the outside, any more than Renaissance artists could discover how animals worked without opening them up and poking about inside. As the diplomatic apparatus of the United States, the State Department is directly involved in putting a friendly face on empire, concealing its underlying mechanics. Every year, more than $1 billion is budgeted for “public diplomacy,” a circumlocutory term for outward-facing propaganda. Public diplomacy explicitly aims to influence journalists and civil society, so that they serve as conduits for State Department messaging. While national archives have produced impressive collections of internal state communications, their material is intention- ally withheld or made difficult to access for decades, until it is stripped of potency. This is inevitable, as national archives are not structured to resist the blowback (in the form of withdrawn funding or termination of officials) that timely, accessible archives of international significance would produce. What makes the revelation of secret communications potent is that we were not supposed to read them. The internal communications of the US Department of State are the logistical by-product of its activities: their publication is the vivisection of a living empire, showing what substance flowed from which state organ and when. Diplomatic cables are not produced in order to manipulate the public, but are aimed at elements of the rest of the US state apparatus, and are therefore relatively free from the distorting influence of public relations. Reading them is a much more effective way of understanding an institution like the State Department than reading reports by journalists on the public pronouncements of Hillary Clinton, or Jen Psaki. While in their internal communications State Department officials must match their pens to the latest DC orthodoxies should they wish to stand out in Washington for the “right” reasons and not the “wrong” ones, these elements of political correctness are themselves noteworthy and visible to outsiders who are not sufficiently indoctrinated. Many cables are deliberative or logistical, and their causal relationships across time and space with other cables and with externally documented events create a web of interpretive constraints that reliably show how the US Department of State and the agencies that inter-operate with its cable system understand their place in the world. Only by approaching this corpus holistically—over and above the documentation of each individual abuse, each localized atrocity—does the true human cost of empire heave into view. While there exists a large literature in the structural or realpolitik analysis of key institutions of US power, a range of ritualistic and even quasi-religious phenomena surrounding the national security sector in the United States suggests that these approaches alone lack explanatory power. These phenomena are familiar in the ritual of flag-folding, the veneration of orders, and elaborate genuflection to rank, but they can be seen also in the extraordinary reaction to WikiLeaks’ disclosures, where it is possible to observe some of their more interesting features. When WikiLeaks publishes US government documents with classification markings—a type of national-security “holy seal,” if you will—two parallel campaigns begin: first, the public campaign of downplaying, diverting attention from, and reframing any revelations that are a threat to the prestige of the national security class; and, second, an internal campaign within the national security state itself to digest what has happened. When documents carrying such seals are made public, they are transubstantiated into forbidden objects that become toxic to the “state within a state”—the more than 5.1 million Americans (as of 2014) with active security clearances, and those on its extended periphery who aspire to its economic or social patronage. There is a level of hysteria and non-corporeality exhibited in this reaction to WikiLeaks’ disclosures that is not easily captured by traditional theories of power. Many religions and cults imbue their priestly class with additional scarcity value by keeping their religious texts secret from the public or the lower orders of the devoted. This technique also permits the priestly class to adopt different psychological strategies for different levels of indoctrination. What is laughable, hypocritical, or Machiavellian to the public or lower levels of “clearance” is embraced by those who have become sufficiently indoctrinated or co-opted into feeling that their economic or social advantage lies in accepting that which they would normally reject. Publicly, the US government has claimed, falsely, that anyone without a security clearance distributing “classified” documents is violating the Espionage Act of 1917. But the claims of the interior “state within a state” campaign work in the opposite direction. There, it orders the very people it publicly claims are the only ones who can legally read classified documents to refrain from reading documents WikiLeaks and associated media have published with classification markings on them, lest they be “contaminated” by them. While a given document can be read by cleared staff when it issues from classified government repositories, it is forbidden for the same staff to set eyes on the exact same document when it emerges from a public source. Should cleared employees of the national security state read such documents in the public domain, they are expected to self-report their contact with the newly profaned object, and destroy all traces of it. This response is, of course, irrational. The classified cables and other documents published by WikiLeaks and associated media are completely identical to the original versions officially avail- able to those with the necessary security clearance, since this is where they originated. They are electronic copies. Not only are they indistinguishable—there is literally no difference at all between them. Not a word. Not a letter. Not a single bit. The implication is that there is a non-physical property that inhabits documents once they receive their classification markings, and that this magical property is extinguished, not by copying the document, but by making the copy public. The now public document has, to devotees of the national security state, not merely become devoid of this magical property and reverted to a mundane object, it has been inhabited by another non- physical property: an evil one. This kind of religious thinking has consequences. Not only is it the excuse used by the US government to block millions of people working for the “state within a state” from reading more than thirty different WikiLeaks domains—the same excuse that was used to block the New York Times, Guardian, Der Spiegel, Le Monde, El País, and other outlets publishing WikiLeaks materials. 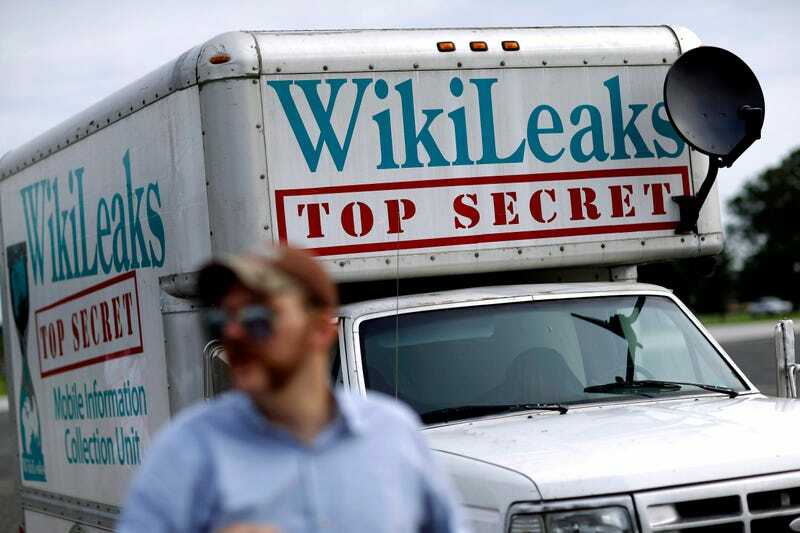 The recent disclosure of US Government documents by WikiLeaks has caused damage to our national security.Classified information, whether or not already posted on public websites, disclosed to the media, or otherwise in the public domain remains classified and must be treated assuch until such time it is declassified by an appropriate US government authority … Contractors who inadvertently discover potentially classifiedinformation in the public domain shall report its existence immediately to their Facility Security Officers. Companies are instructed to delete the offending material by holding down the SHIFT key while pressing the DELETE key for Windows-based systems and clearing of the internet browser cache. A swathe of government departments and other entities, including even the Library of Congress, blocked internet access to WikiLeaks. The US National Archives even blocked searches of its own database for the phrase “WikiLeaks.”So absurd did the taboo become that, like a dog snapping mindlessly at every- thing, eventually it found its mark—its own tail. By March 2012, the Pentagon had gone so far as to create an automatic filter to block any emails, including inbound emails to the Pentagon, containing the word “WikiLeaks.” As a result, Pentagon prosecutors preparing the case against US intelligence analyst PFC Manning, the alleged source of the Cablegate cables, found that they were not receiving important emails from either the judge or the defense.10 But the Pentagon did not remove the filter— instead, chief prosecutor Major Ashden Fein told the court that a new procedure had been introduced to check the filter daily for blocked WikiLeaks-related emails. Military judge Col. Denise Lind said that special alternative email addresses would be set up for the prosecution. There is even an extensive use of WikiLeaks materials, particularly cables, in courts, including domestic courts, from the United Kingdom to Pakistan, and in international tribunals from the European Court of Human Rights to the International Criminal Tribunal for the former Yugoslavia. Set against the thousands of citations in the courts and in other academic areas, the poverty of coverage in American international relations journals appears not merely odd, but suspicious. These journals, which dominate the study of international relations globally, should be a natural home for the proper analysis of WikiLeaks’ two-billion-word diplomatic corpus. The US-based International Studies Quarterly (ISQ), a major international relations journal, adopted a policy against accepting manuscripts based on WikiLeaks material—even where it consists of quotes or derived analysis. According to a forthcoming paper, “Who’s Afraid of WikiLeaks? Missed Opportunities in Political Science Research,” the editor of ISQ stated that the journal is currently “in an untenable position,” and that this will remain the case until there is a change in policy from the influential International Studies Association (ISA). The ISA has over 6,500 members worldwide and is the dominant scholarly association in the field. The ISA also publishes Foreign Policy Analysis, International Political Sociology, International Interactions, International Studies Review, and International Studies Perspectives. The ISA’s 2014–15 president is Amitav Acharya, a professor at the School of International Service at the American University in Washington, DC. Nearly half of the fifty-six members on its governing council are professors at similar academic departments across the United States, many of which also operate as feeder schools for the US Department of State and other internationally- oriented areas of government. That the ISA has banned the single most significant US foreign policy archive from appearing in its academic papers—something that must otherwise work against its institutional and academic ambitions—calls into question its entire output, an output that has significantly influenced how the world has come to understand the role of the United States in the international order. This closing of ranks within the scholar class around the interests of the Pentagon and the State Department is, in itself, worthy of analysis. The censorship of cables from international relations journals is a type of academic fraud. To quietly exclude primary sources for non-academic reasons is to lie by omission. But it points to a larger insight: the distortion of the field of international relations and related disciplines by the proximity of its academic structures to the US government. Its structures do not even have the independence of the frequently deferent New York Times, which, while it engaged in various forms of cable censor- ship, at least managed to publish over a hundred. These journals’ distortion of the study of international relations and censorship of WikiLeaks are clear examples of a problem. But its identification also presents a significant opportunity: to present an analysis of international relations that has not been hobbled by the censorship of classified materials. The response of the United States to the release of the WikiLeaks materials betrays a belief that its power resides in a disparity of information: ever more knowledge for the empire, ever less for its subjects. In 1969, Daniel Ellsberg—later famous for leaking the Pentagon Papers—had a top-secret security clearance. Henry Kissinger had applied for his own top-secret clearance. Ellsberg warned him of its dangers:[I]t will … become very hard for you to learn from anybody who doesn’t have these clearances. Because you’ll be thinking as you listen to them: “What would this man be telling me if he knew what I know? Would he be giving me the same advice, or would it totally change his predictions and recommendations?” You will deal with a person who doesn’t have those clearances only from the point of view of what you want him to believe and what impression you want him to go away with, since you’ll have to lie carefully to him about what you know. In effect, you will have to manipulate him. You’ll give up trying to assess what he has to say. The danger is, you’ll become something like a moron. You’ll become incapable of learning from most people in the world, no matter how much experience they may have in their particular areas that may be much greater than yours. Freed from their classified seals, the WikiLeaks materials bridge the gulf between the “morons” with security clearances and nothing to learn, and us, their readers.